I’m a classic British female voice over artist who delivers an elegant, assured, authoritative and approachable tone. 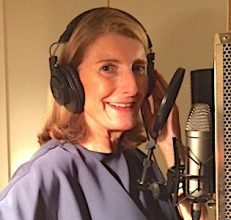 I’m an experienced, professional voice over artist with over 30 years’ experience as an actor and voice over. I trained at Rose Bruford College. You may well have heard me on TV, and Radio including TV promotional campaigns, explainer videos, audio dramas, telephone greeting messages, eLearning and video games, charity campaigns. If you have a project that requires a relaxed professional, clear, stylish delivery get in touch. Naturally RP, my voice is suitable for soft sell ads, to explainer videos and e learner programmes, also straight talking business/corporate reads, with an authoritative edge. If you’re looking for a professional, sophisticated warm, rich, elegant delivery, I am the perfect voice for your project. I have a host of character voices to offer you as well, if you’re telling a story, and want it brought to life, with a range of different believable characters. Impersonations as well, try me! Just have a listen to my demos, If you like what you’ve heard and think we could work together, get in touch. I can record a section of your script as a sample for you to listen to before you make a decision to book. I’m based in London, with a home studio, I can offer a fast turnaround. Happy to travel to a studio to record as well. Just send me your details and a script! According to usage prices vary, Broadcast, Non broadcast, Educational, Radio, Telephony (IVR), different rates apply. Give me a call, or contact me with the simple form, and I will be happy to give you a quote – I’m reasonably priced. This will give you and your client a chance to hear my voice with your script. Then once you are happy and all is approved and agreed we can move to the final stage of me recording and delivering the audio files you need ready to work perfectly with your project. The project will of course be treated as confidential at all stages of the process. Any questions, or if you would like a sample read, just send the form via email: claire@clairevousden.com or call me on 07976 421497.